It was in the 1830’s that things really start to cook. In 1830 we have Perry’s first pen patent, in 1831, Sampson Morden and William Brockeden invent the oblique pen and pen holder, also in 1831 is Gillott’s first pen patent, and in 1832 we find Perry’s second patent, the origin of the Perryan Double Patent Pen. Altogether, there are 16 British patents related to pens and pen holders in the 1830’s as opposed to only 2 in the 1820’s, one of which was for an inkstand. By 1831, Perry is already shipping pens to the US. 12 1/4 cents ($1.47 per dozen) is a lot less than Williamson’s 100 cents per pen of just 20 years before. Prices are starting to come down, but they have a long way to go before they reach true mass-production levels. By 1843, the large stationer David Felt is selling his high-end pens for $1.50 per gross, the cheap ones go for 1 shilling (about 60-cents at the time) per gross. In 1832 we see Gillott start advertising in the prestigious Times of London. This December 11th ad also announces his move to a much larger factory space at 59 Newhall St. in Birmingham. Richard Mosley is an interesting character because in the next decade we begin to see him selling pens branded with his own name. It’s not clear if he’s making his own, or having one of the Birmingham makers do it for him as a custom imprint. This is a practice that lasts as long as steel pens are made and one that makes research into actual makers a challenge. This issue of stationers and other merchants paying a pen manufacturer to make pens with their name on it goes back to practically the very beginning of the post-craftsman era. Was not Josiah Mason making pens for Perry with Perry’s name on them? Perry stopped making his own pens after 1829, and was solely concerned with design, and marketing. This starts to really become a problem in this decade of the 1830’s as the number of names on pens starts to grow. It’s not always clear who is making the pens, and who is merely marketing them. John Mitchell made some pens for Gillott, Mason was making all the pens for Perry, and so on. As I mentioned above, the number of names on pens starts to drastically increase in the 1830’s. Only looking at pens sold in the US, in the 1820’s I’ve found evidence of five different brands of steel pen being sold. In the 1830’s that jumps to 17. Of these, Windle’s were probably Gillott pens; Windle is identified as just a merchant in the patent he and Gillott share. But this is only a guess on my part. Heeley was also a large purveyor of luxury goods, and most likely had his pens made by Josiah Mason. It was Heeley, after all, who had befriended the young Mason and introduced him to to his mentor Harrison. A few of the remaining may be merchants and not manufacturers themselves, but it’s not always either easy to tell, nor is it cut and dried. Sampson Mordan, for example, was a merchant and purveyor of luxury goods like silver card cases and perfume bottles, but he was also an inventor and manufacturer as well. In 1822, Sampson Morden and an engineer John Isaac Hawkins, were granted a patent. 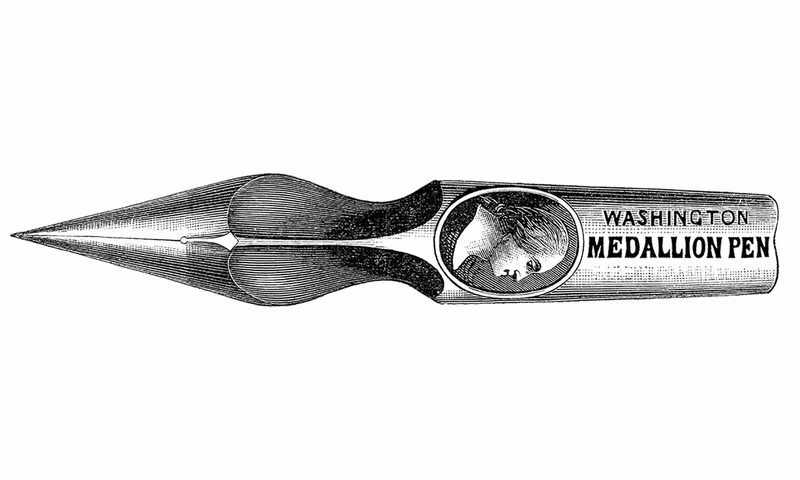 This patent describes not only a way to encase a pencil or crayon in a tube, which became one of the first successful mechanical pencils, it also includes a description of pens made of tortoiseshell or horn whose tips are embedded with “larger pieces of diamond, ruby, gold or other hard substances.” While the shell or horn was soft, they would also embed in them small slips of gold to help stiffen and strengthen the primary substance. These were not, as you can imagine, inexpensive. Mordan’s company made these composite pens for a while but they were rather fragile, and the tips came off pretty easily, which rendered them useless. But Mordan was not finished looking for alternatives to quill pens. As I’ve mentioned before, he and William Brockeden, a painter and inventor in his own right, invented the first oblique nib as well as the oblique pen holder, with the patent granted in 1831. These were sold quite successfully, and were quickly copied as soon as the original patent ran out. But Mordan was not content to stop there. In the early 1830’s, a watchmaker from London, James Gowland, created a way to pierce a steel pen and bend the resulting slip of steel back around to create a type of reservoir which could hold more ink in a single dip than a regular pen. This design may have been the very first such reservoir pen ever made. It seems that there were some issues with his early design that prevented it from being manufactured easily, i.e cost effectively. Mordan, upon being shown the design, developed some improvements which allowed for mass-production at an economical price, and Mordan then patented those improvements and began selling his Triple Point Pens, and his Counter Oblique nib (an improved oblique nib with reservoir, see figures 3 in the picture blow). A long and detailed answer to this letter was published in a later issue from William Baddeley of London, a prominent inventor in his own right, who spoke with some authority as one of the folks involved in negotiating the connection between Gowland and Mordan. Baddeley points out that Mordan’s patent is for improved methods to MAKE the pens, in other words, manufacturing methods, that made the pens commercially viable and that Mordan is not actually stealing Gowland’s invention but instead is working with the original inventor to make these new pens. As you can see from the diagrams, the slit of steel punched out is bent over top of the nib. This is the earliest example I’ve found of a reservoir nib, but far from the last. In the 1830’s the American market was only starting to wake up to the promise of steel pens. Peregrine Williamson was no longer producing, but even he saw the potential and he made some noises of coming back into the pen business in 1835, there’s no evidence he ever did. He made a lot of his own paper goods, like blank books (ledgers, journals, etc…) and playing cards. He first had a factory in Boston, and then moved it to New York City. When he needed to grow out of that, he expanded and moved to Brooklyn, on Front St. between Adams and Pearl, right where one of the piers of the Brooklyn Bridge stands today. Later, in 1844, his business was growing so fast he looked for land in New Jersey to open a second factory. This became a factory town, Feltville. He eventually sold this property around 1865 as he retired after 50 years in the stationery business. David Felt was a large and successful business man. He jumped on the steel pen trade in the 1820’s. By 1839 he was selling his own line of Stationer’s Hall pens. It’s not clear if he was making them in his Brooklyn workshop, or if he had them imported from a British house with his own imprint. He did sell a great deal of British stationery and fancy goods, but then he made a lot of his own materials and so he had mechanics and tool makers who could have created his own machines to make his own pens. Atwood pens pop up from the early-to-mid 1830’s up through 1840. While Atwood made his office in the stationery hub, New York City, he began a bit further north in Massachusetts. Much of the following history is from an 1880 history of the old town of Derby, Ct. where Atwood had a factory for a while. When he was 19 he began working for a Giles Tincker of North Adams, Mass. at a woolen mill. During his two years there, he invented a better means to remove wool from the carding machine, called the double doffer. Even though he was granted a patent in 1830 for this discovery, he was never in a position to protect his patent so he lost all benefit from it. Charles’ initial manufacturing operation was rather modest. In 1834, his pens were awarded a Diploma at the American Institute’s fair in New York City. This was also the fair where Goodyear displayed samples of India Rubber. Atwood’s pens were displayed under the category of “Cutlery, Edge Tools and Hardware” as there was no category, yet, for steel pens. In 1835 he entered his pens in the first annual fair of the Mechanics’ Institute on New York City. His pens were described as “very good of style and execution” and were awarded a diploma. By 1836 Charles had an office at 72 Maiden Lane where he stayed until at least 1840, after which no trace of his pen making can be found. By that point he had moved on to another invention, a new way to making hooks and eyes for clothing and sewing them onto cards. After he was able to sell that patent (he’s getting smarter), he moved on to inventing and patenting a machine for making various kinds of specialized chains. And then a machine for making pins that even in 1880 was still so fully used by the industry it was called an “Atwood machine.” He finally died at the young age of 53 from a congestive fever after a life of invention and innovation. The 1830’s innovation and expansion was primarily on the eastern side of the Atlantic. (the indomitable Charles Atwood as the main exception) Patents, new factories, wider markets, all saw the British steel pen trade, especially in Birmingham, explode. In the 1840’s, the American entrepreneurs begin to respond and a new crop of manufacturer begin to come forth. But that’s for next time. From about 1805 until about 1820 there were only a few people making and selling pens, with Williamson and Wise being the largest and widest distributed. There may have been others who made pens still on the craftsman scale and sold locally, but they’re less visible from this distance. All of that changed in the 1820’s. This is the time when the British, and especially in Birmingham, introduced mass production methods, and consistency of quality to leave the craftsman’s workshop behind and become a true industry. There are several major names which first appear in this period, including James Perry, Josiah Mason, John and William Mitchell, and Joseph Gillott. These were not the only makers in the 1820’s, but they were the foundational innovators and inventors who took a craft and turned it into an industry. These folks also have the most written about them. For a fuller account, visit the Birmingham Pen Museum and/or get yourself a copy of People, Pens and Production (PPP)*, a book of essays about the rise and history of Birmingham’s pen trade. Because there is more information available elsewhere, I’ll only cover an outline of the period to give you an idea of how this all started. Much of the information below comes from this interesting book. Throughout the 18-‘teens, Wise was making his barrel pens and selling them throughout England as well as America. He continued doing this well into the 1820’s. But he was soon to have competition. By 1820 James Perry was making pens in Manchester. He soon moved to London and became known for his inventive marketing and variety of pens. He was successfully making pens and selling them widely in 1828 when Josiah Mason, a small manufacturer of spit rings in Birmingham, sent him a few samples of an improved pen based on Perry’s own pens. Within a few days, Perry showed up in Mason’s workshop, in person, and hired him to start making the Perryan pens for the next 40 years. Josiah Mason had been a hard-working entrepreneur from his childhood. When he was a young man he was introduced to Samuel Harrison, the split ring manufacturer who, in the 1790’s, had made pens for his friends, including the famous chemist Dr. Priestly. Harrison was impressed and not only hired Mason, but eventually chose him to take over his business. It was while Mason was successfully making his split rings (for key rings), and other steel “toys” (the term at the time for small buckles and other small, steel ornaments) when he saw some of Perry’s pens being sold in a stationer’s window. He purchased one and worked for a few weeks to see if he could make it better, especially focusing on better steel and manufacturing quality to improve flexibility. The results of these experiments set up Josiah Mason to be the maker of the famous Perryan Pens for decades to come before starting off on his own. Mason’s factory eventually became the largest pen factory in the world, but before that could happen, a few other folks came along in the 1820’s to add their contribution to the industry. The Mitchell Brothers (John and his younger brother William) seem to have been the first to really apply industrial practices and machines to the making of steel pens. This application of machinery, especially the hand screw press, to the making of pens was the beginning of a real revolution in the availability, and especially the affordability, of steel pens. When John Mitchell first began selling pens, his pens were 30s(hillings) a dozen. Within a few years, after the application of the machinery, the price fell to 1s 6d(pence) a gross. John’s younger brother, William, worked with him for a while before setting out on his own and starting his own steel pen business. William eventually found great success and became one of the largest and most successful pen makers in the world. In 1821, John and William’s sister Maria also began her entry in the steel pen trade by marrying a young man of Huguenot decent from Sheffield, Joseph Gillott. From these humble beginnings, Gillott went on to be one of the largest pen makers in the world, and many of his pens are considered the finest examples of the flexible pointed pen, and are highly valued by calligraphers to this day. But in the 1820’s, he was just getting started. By 1820 in the United States, Peregrine Williamson seems to have lost interest in pens, leaving only Wise still advertising. These early British manufacturers hadn’t gotten to the point, yet, of shipping their wares to the poor, benighted savages in the former colonies in any great quantities. That is not to say people in the US weren’t using steel pens. You still find them being sold by stationers, like in this Chapman’s ad from 1829. And in 1828, the US House of Representatives spent a whole $1.00 on steel pens, (compared to $1,359.27 on quills). The full on assault by the Birmingham makers on the American market wasn’t to start until the 1830’s, and when it did, it combined with a series of other elements to create a whole new booming industry. And when you have a boom, there are always people who want to get a piece of that pie, and the number of manufacturers began to grow rapidly on both sides of the Atlantic. * People, Pens & Production in Birmingham’s Steel Pen Trade, ed. by Brian Jones MBE, Brewin Books, 2013. In the last entry on pen history, I wrote briefly about The Craft Era. There were two main makers from that era: Wise of London, and Peregrine Williamson in Baltimore. I wanted to share a bit more about Williamson who was not only an early pioneer and innovator, he was most likely the first financially successful pen manufacturer anywhere. Peregrine Williamson was born around 1770. In 1800 he was a working jeweler in Baltimore when, as the story goes, he made a steel pen for himself as he was having trouble cutting a quill to his own satisfaction. At first, this tube-shaped steel pen suffered from the same stiffness that plagued other attempts at making a steel pen. Peregrine worked at fixing this and finally came upon a method of adding two additional slits, one on each side of the main slit. This increases the flexibility of the tines by, essentially, making the tines narrower, as well as moving the center of flex forward towards the end of the slit. With less steel to flex, it became easier to bend the tines. Here’s a more modern version of the same side slit. There’s another one on the other side. In 1809 he submitted a patent for this discovery. It was issued on 22 November 1810. Unfortunately, this patent disappeared with so many others in the 1835 fire. It is one of the missing “X” patents and was 1,168X. If anyone has seen this I, and the patent office, would love to see it as well. By 1808 he was advertising his pens as the Williamson Patent Elastic Three Slit Pen. His early advertisements include excerpts from a letter from then President Thomas Jefferson, to whom Williamson had sent some sample pens. They also included an endorsement from Francis Foster, a writing master at St. Mary’s Catholic Seminary and College in Baltimore. After several years of successful business, we had a bit of trouble with our friends across the Atlantic. In 1812 Peregrine Williamson enlisted in the 51st Regiment of the Maryland Militia for the defense of Baltimore. He was present during the battle of North Point where the British landing to take Baltimore was eventually repelled, and then was also present for the next two days at Fort McHenry during the British bombardment, which inspired Francis Scott Key to pen the national anthem. It’s not clear how long he made pens, but he may well have continued through the few years of the war. The latest ad I have found for his pens is from late 1813. The first mention that we find of steel pens for writing, is in 1803, when Mr. Wise constructed barrel-pens of steel, mounted in a bone case for convenience of carrying in the pocket. These pens were very dear, and produced to their inventor but a scanty income. For many years, however, Wise’s pens were the only steel pens that could be had, and by means of great activity in “pushing a sale” of them, they could be had at almost every stationer’s shop in the kingdom. Something else happened in the 1820’s, and that was the first blossoming of the British pen trade. One of the major innovations frequently attributed to the British at this time, was the three-slit pen for increased flexibility. Gillott’s 1831 patent lays claim to the invention of making the tines as straight, parallel strips of metal rather than sloping from the shoulder to the tip. This is accomplished via the two slits on the side, making them parallel to the main slit in the middle. In other words, he’s found a way of patenting the result of two slits parallel to the main slit, not the slits themselves. This wording may well have been one of the impetuses for the wide variety of side slits you begin to see, from “T” slits, “L” slits all the way up to outright cut-outs where the metal is taken away entirely at the sides. Here’s a more modern pen (c. 1920’s) with the same kind of side slit as you found in 1830. As you can see, by separating it from the shoulder, it creates a straight tine with parallel sides. The slit is shown in the yellow oval, the tine is delineated by the rectangle. One great difficulty to be overcome was [the early steel pen’s] extreme hardness and stiffness; this was effected by making slits at the side in addition to the central one, which had previously been solely used. A further improvement, that of cross grinding the points, was subsequently adopted. The first gross of pens with three slits was sold for seven pounds. But how do we account for Williamson’s advertising (and patenting) his “three slit pen” over 20 years before? Could this be a case of independent invention? Well, the Journal of Commerce certainly does not think so. A sample of [Peregrine Williamson’s three slit] pens was sent out to England, and imitations soon came back, placarded with an Englishman’s name as the inventors, “by His Majesty’s Royal Patent.” The Englishman [Gillott] could not invent so much as a card even, but made almost a facsimile of Mr. Williamson’s. The same cards have been perpetuated to this day, and the business has been pursued by the English manufacturers, until more than a hundred tons of steel are now used annually in the manufacture of more than two hundred millions of pens, and the price is reduced to a few cents. The English manufactures, in the mean time, have realized immense fortunes by the invention, but have added nothing to the principles of Mr. Williamson, nor, after all their change of form, have they contrived anything better than his, or so good. Well, if that isn’t throwing down the gauntlet at the esteemed Gillot, Perry, et. al. I am not sure what else would suffice for a challenge? He even goes after Gillott for using cards to package pens. It seems that Williamson sold his pens for $1.00 each or $9 for a card of a dozen. And indeed, pens were very often sold on a card containing a dozen pens in the early days of the 20’s and 30’s. What we do know is that the three-slit pen was not a novel invention of the British. And there seems to be an indication that at least some of these American three-slit pens made their way to England before this invention was claimed on that side of the Atlantic. It is a not-unlikely possibility that this idea was at least started by Peregrine Williamson, even if it was taken further by the early pen makers of Birmingham. An additional interesting twist to Peregrine Williamson’s career is when he decided to get back into the pen game around 1835. He filed another patent as an improvement over his old patent of 1810. This was issued in 30 March 1835 and is another of the lost “X” patents. It 8,735X. The first is a sliding clasp, which being moved up or down makes the pen more or less flexible, at the pleasure of the writer. The other is hardening the extreme of the nib [the very end of the tip] in the most extreme degree. By these two improvements which Mr. Williamson has or will secure, by patent, he hopes to clasp again the profits of his invention. We are now writing with one of his three-slit, sliding-clasp, diamond points, and it is certainly a very fine pen. The same concept even shows up later in fountain pens in the Eversharp Doric adjustable nib introduced in 1932. Unfortunately, I’ve not seen any evidence that Mr. Williamson ever made any of these new pens, or started a new company, but the search continues. Peregrine Williamson died in 1841 at the age of 71 of apoplexy. For such an important, early figure, very little is actually known about him. He appears in no census data, very few directories, no genealogies. Very little is known about his personal life, where he was born or raised, or even how he made his pens. What we do know is that he was a true pioneer and innovator, and he can truly be said to be the first American steel pen manufacturer. **Thanks go out to Mariam, a wonderful Reference Librarian at the Patricia D. Klingenstein Library at the New York Historical Society for her kind help and for finding Peregrine’s War of 1812 service and death notice.